“Charlotte” is the name my aunt gives to her favourite pudding. Jams, sponge finger biscuits and diluted rum are the ingredients of this delicacy, which requires no cooking. Don’t expect any proportions here. My aunt, 92, who has been making this pudding for probably more than half a century, was kind enough to give me some indication of her recipe yesterday, as she had just made one for my father’s birthday. I am sharing her advice with you today so you can play with this personal interpretation of a charlotte pudding. “What is important is to use several varieties of jam” she says. It gives the pudding its originality. 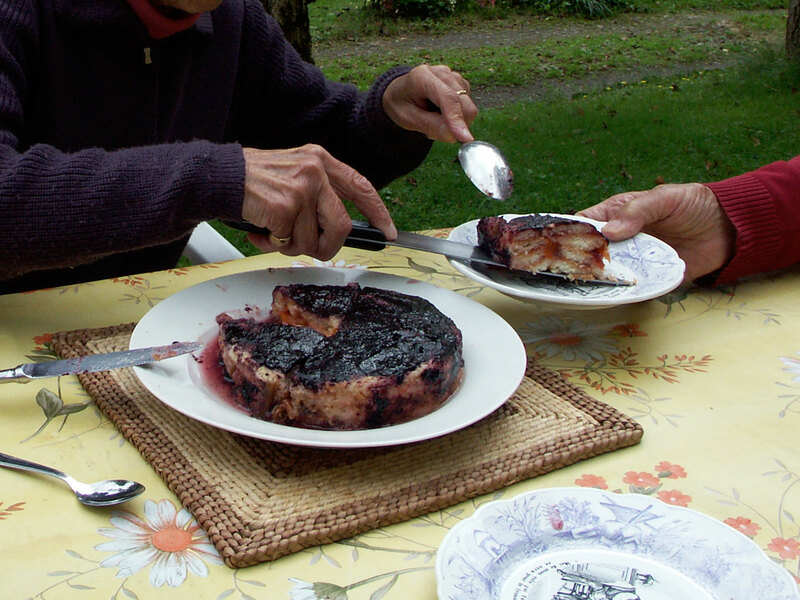 Yesterday, or more exactly the day before, as the cake needs to soak into diluted rum for 24 hours before eating, she used apricot and plum jam, red currant jam and blueberry jam. She doesn’t mix them, she just spreads them in various layers, so the lucky eaters can feel the contrast of tastes, sweetness and acidity in their mouth. So, how do you make this pudding? Take sponge finger biscuits, I would say thirty to forty for a four to six portions cake, and make a layer at the bottom of a 25cm or so mould (I am trying to give some proportions here). Moisten with the diluted rum (I would say a mix of half rum and half water). Then add a layer of one of the jams. Repeat the operation to have several layers of biscuits and the various jams. Finish with one layer of biscuits that will go slightly over the top of the mould. Put a plate with some weight on it, and leave for 24 hours in the fridge. It will act as a press for the pudding to be slightly more compact (but not too much, the result should be much lighter than a Christmas pudding) and well soaked. It is a good idea to start and slightly press every layer with a large spoon. I would say it takes around a quarter of an hour to prepare the pudding and then 24 hours for it to soak into the rum and get its final shape. Before serving, turn the pudding out of the mould and add a final layer of jam. Serve with custard, it will be even more delicious. 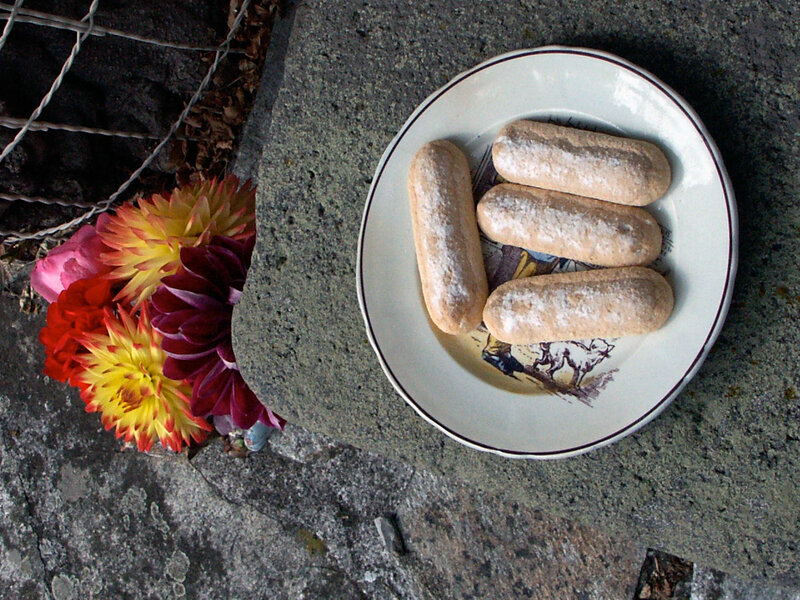 Soft sponge fingers can be purchased in supermarkets. Hard sponge fingers can be used too. Photo 29th September. The picture is not very clear, but you can see that the sponge fingers have not been too much pressed and keep some of their shape. They have been soaked enough not to be dry either. Many sorts of jams can be used. Actually this is a good recipe to use the bottoms of the jars opened for a while, when people in the family feel like opening new ones from different fruits. Here alcohol is rum. Cognac, Grand Marnier are other options, like the more confidential Benedictine, one of my favourite additives to tasty desserts. And it doesn’t have to be alcohol, a mango juice for instance would give an excellent result I believe! A less sweet variant of the recipe is to use jam and compote. Apple, pear, plum compote and some sweeter apricot and raspberry or strawberry jams for instance would make a delicious mix. Overall? A fast and easy dessert to make, with a large number of variants to content the most demanding sweet teeth! 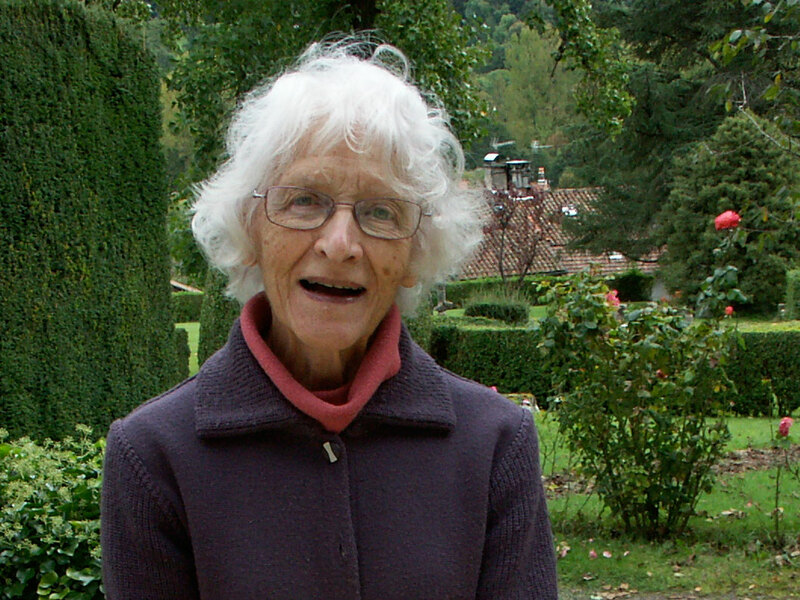 “Tati” is the name we call our aunt, who has been pleasing her guests for many years with her “charlotte” recipe. We were, my father and I, the latest lucky ones, eating the pudding made in that case with some of my own jam. This entry was posted in Eat and tagged Apricots, Blueberries, France, Plums, Saint-Simon by Les Jardins d'ici. Bookmark the permalink.